Being a fashion photographer isn’t without its perks. Travelling the world, rubbing elbows with celebrities and fashion elites, and getting the chance to experience fun and exciting photo shoots are just some of the perks of securing a career as a fashion photographer. So there’s no question why it’s become such a popular job choice for most people. In this article, we will be looking at the best cameras for fashion photography. If you’re an aspiring fashion photographer and you want to break into the competitive industry, you should consider upgrading your camera. Yes, not all cameras were made to be used for fashion photography – there are a select few that suit the job much better. Find out more about the best cameras for fashion photography with our complete and comprehensive review. First up in our search for the best cameras for fashion photography. Lots of DSLR cameras riddle the market, but based on our research, the Canon EOS 70D Digital SLR Camera has to be one of the best cameras for fashion photography, and for good reasons. The device boasts a 20.2 megapixel CMOS sensor that works together with a DIGIC 5+ image processor. Basically, these two pieces of high-end hardware give the 70D the capacity to produce high-quality images with incredible detail and superb sharpness which brings fabrics and clothing to life. The 70D also boasts a super fast and precise autofocus system that makes it easier to capture movement for lively and exciting fashion images that really pop with life. It’s also very fast when it comes to locking in on your subject, so you don’t have to wait for the device to focus during those fast-paced fashion shoots. 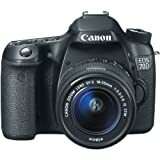 Finally, the 70D also comes equipped with an ISO range that spans 100-12800, expandable up to 25600. This makes it a great companion for a number of different shooting conditions, so you can take your shoots outside without worrying about losing the quality of your shots. Superb, reliable, and durable construction makes it one of the best Canon cameras for fashion photography, especially for everyday use. 20.2 megapixel CMOS sensor works in unison with the DIGIC 5+ image processor to produce superb photograph quality. Fast autofocus makes it possible for you to capture movement of fabrics for impressive and artistic results. ISO of 100-12800 lets you use the device in a variety of settings without losing the quality of light. No sensor to turn off the LCD screen when the viewfinder is in use. Next up in our search for the best cameras for fashion photography. While lots of digital cameras and even smartphone applications make it possible to reproduce the aesthetic of film cameras, there’s still something about being able to use a real film camera that steps up that unique style. And although it might not seem like a practical choice to many, there are lots of fashion photographers who actually use film cameras to help bring a period aesthetic to their captures. In many ways, could possibly be the best camera for high fashion photography. This device is hailed as one of the best film cameras in the market and features superb functionality despite being an older release. What really makes it sell is its incredible photo quality that really steps up the style and aesthetic of images. The device also functions mainly through manual manipulation. That means focus, exposure control, and all the other settings of the camera need to be manually set unlike present-day cameras that afford you the opportunity to get the right settings automatically and effortlessly. This is what makes it a great camera for fashion photography as it gives you the ability to control virtually all aspects of your shot, which in some cases can be a great advantage especially for high-end shoots that require specific creative direction. Gives you great control over your images so you can take complete direction over each shot. Reasonably easy to use despite being a completely manual camera. Produces exceptionally high-quality ideal for capturing the detail and intricacy of clothing and fabric. Impressively constructed, extending the life of the device for years even with daily wear and tear. The viewfinder might not be able to provide an accurate representation of your shot. Next up in our search for the best cameras for fashion photography. 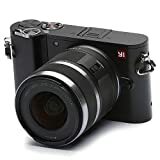 If you’re just starting out and you want to stick to a budget, then the YI M1 4K Mirrorless Digital Camera might be a good choice for you. As a mirrorless camera, the YI M1 offers quite impressive versatility despite its price, so this gives you the ability to experiment with different outcomes to learn more about your personal style when it comes to fashion photography. Despite being a start-up brand, this camera uses a Sony brand IMX269 image sensor that’s rated at 20 megapixels. The sensor is also what gives the device the capability to capture images and footage at 4K, which can be highly beneficial if you want to explore your horizons. This is what gives the device an edge, with some people even saying it performs just as good as some of the best Sony cameras for fashion photography. The kit lens that comes with the camera is another thing to talk about. Designed for portrait photography and macro photography, the simple attachment makes it easy to capture your subject in the perfect depth to give greater attention to clothes and fashion. Lastly, the M1 seems to have been designed with beginners in mind. The camera has a built-in master guide that helps you navigate through settings to ease the process of setting up your shot. As a first-time fashion photographer, this can come in handy especially when you’ve yet to explore the different opportunities and options that your device has in store for you. Up to 50 different lenses compatible with the device thanks to its versatile MFT mount. Pocket-friendly price despite being a top performing mirrorless camera. Easy connectivity to smartphones and laptops for seamless file transfers and photo management. 4K footage and still image capabilities improve the quality of your captures for superb outcomes. Intuitive user interface makes the device very easy to handle and manage to make the experience simpler for starters. After sales services may not be the best as the brand is just a start-up. Next up in our search for the best cameras for fashion photography. Now, while the previous option our list of the best cameras for fashion photography may have been a suitable choice if you’re a beginner in the fashion photography industry, there is a better camera that will truly suit your needs and preferences especially if you’re just starting out. It comes in the form of the Canon EOS Rebel T7i which has been widely dubbed as one of the best Canon cameras for fashion photography. The device boasts a 24.2 megapixel CMOS sensor that works in combination with a DIGIC 7 image processor. Together, these two components make the device capable of delivering outstanding image quality with superb detail and clarity. The optical viewfinder fitted into the device also makes it a lot easier for users to see their shot before the shutter clicks, preventing the need to take multiple images that won’t make the cut. Finally, the T7i also boasts high-speed continuous shooting at 6 frames per second. Simply put, this feature allows you to take several images at a single time so you can capture movement more accurately – a feature that’s essential for fashion photographers. Feature Assistant allows you to learn more about photography and the device with ease so you can get the most of your new camera and improve your skill minus all the studying and research. Much lighter than other cameras in the same segment, ideal for users who have yet to get accustomed to heftier camera designs. 24.2 CMOS sensor and DIGIC 7 image processor come together to create superb image quality effortlessly. Compatible with a number of different Canon lenses. Continuous shooting at 6 frames per second guarantees that you won’t miss a single detail. Not exactly the cheapest camera on the list, although it isn’t really the most expensive either. Some beginners might find the price tag a little too steep. Next up in our search for the best cameras for fashion photography. One of the best Nikon cameras for fashion photography is the Nikon D5200 Digital SLR Camera. This device is one of the most used in the industry and has been seen lots of times throughout different reviews for the best cameras to use for fashion photography. What makes it such a hit in the fashion photography industry is the way that its different functions and features come together to allow it to capture clothing and models in great detail with impressive ease. For instance, the device comes fitted with a 24-megapixel DX-format CMOS sensor that allows it to generate ultra high-quality images with unrivaled sharpness. With a 39 point autofocus system, the camera can lock in on your target with impressive precision and speed. This is particularly important because models tend to move a lot, especially on the runway. This powerful AF system thus makes it possible to capture noise and distortion-free images even with a moving target. It’s also worth mentioning that the D5200 is also capable of producing high quality 1080p HD video, which further expands your horizons as a fashion photographer. This makes it possible to experiment with editorials and other forms of fashion shoots so you can explore your own personal style and photography preferences. Powerful, feature-rich, and relatively affordable, the Nikon D5200 Digital SLR camera is definitely a top contender on our list of the best cameras for fashion photography. Of course, it’s not without its flaws, but all in all, it makes a really suitable choice for most users. 39 point autofocus system allows you to lock in on targets minus having to wait for your device to search through its focal range. 24-megapixel DX Format sensor makes way for impressive image quality with killer sharpness effortlessly. 5 frames per second continuous shooting allow you to capture multiple pictures at once so you never miss a moment. Capable of shooting 1080p HD video. Reasonably priced, making it one of the more affordable choices on our list. Lots of different cameras for fashion photography litter the market – so which one is the right one for you? The most important features to look for are speed, image quality, and ease of use. These are the cornerstones of a suitable fashion cam that will guarantee the best results with each shot. Be sure to check out these 5 fashion cams that have been tried and tested. We hope you can find a suitable choice to jumpstart your career in this ever competitive industry. The Five Best Canon Lens For Landscape Photography On The Market!